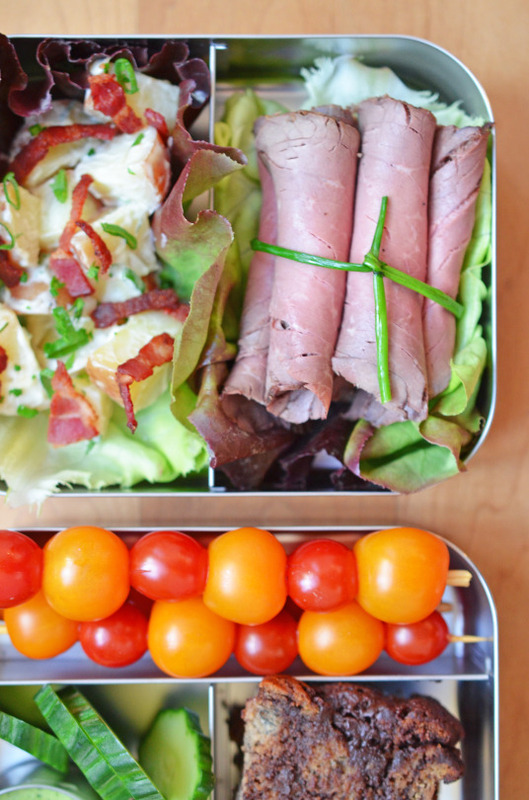 If you’re anything like me, you can’t resist meat and potatoes—especially if we’re talking about roast beef roll-ups paired with potato salad, veggies and dip, and a slice or two of grain-free banana bread. 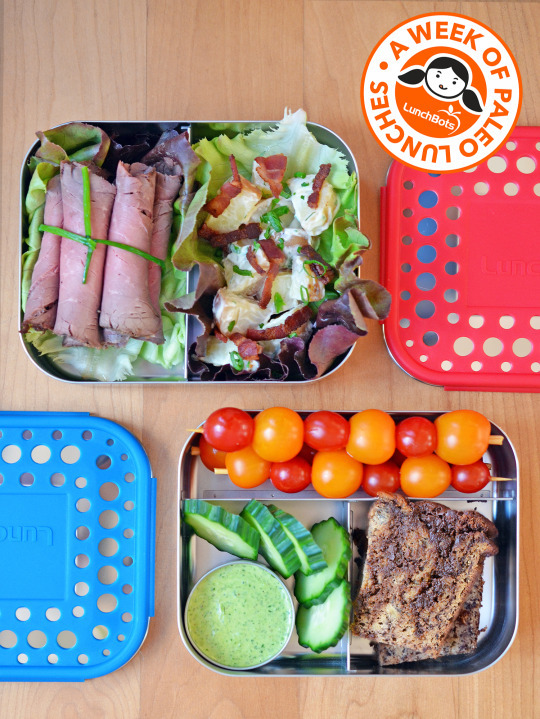 Bonus: This lunch, just like the last three in this series with our friends at LunchBots, yields a big flavor bang despite a minimal investment of time and effort. Ready to learn about my shortcuts to a fabulous lunch? My first shortcut-slash-confession is that I picked up some roast beef at my favorite butcher, Belcampo Meat Co. If you aren’t lucky enough to live near one, Applegate Organics also makes a tasty grass fed roast beef. Of course, if you’re feeling especially industrious, feel free to make your own roast beef by following the recipe for Roast Beast in my cookbook. Just make sure you thinly slice the finished roast across the grain so you won’t spend hours chewing it. 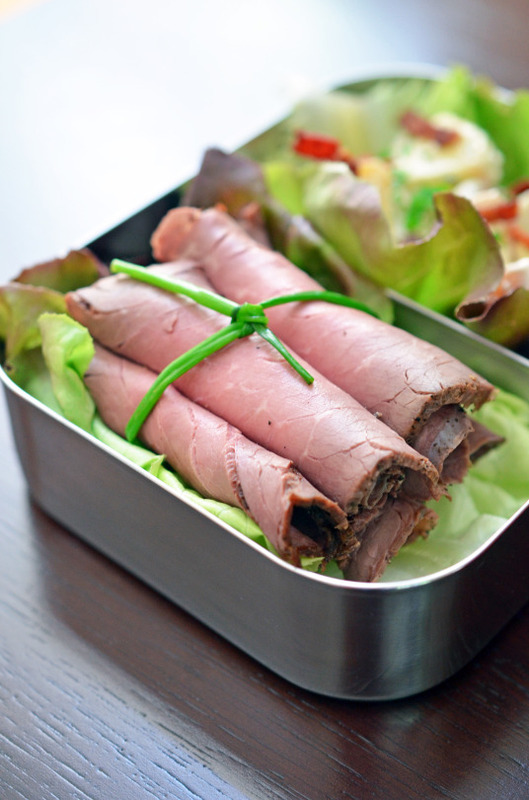 Another tip: tie a chive bow around your roast beef roll-ups. It makes them look all fancy and stuff. 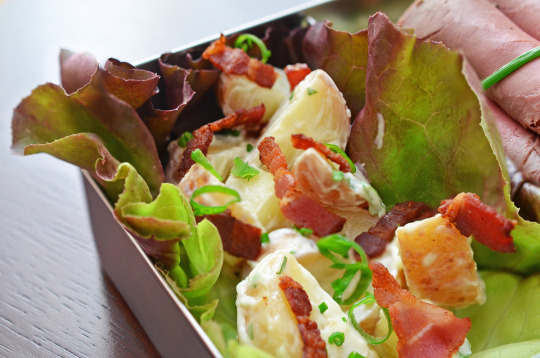 No, your eyes do not deceive you: this here is a bacon-topped potato salad. If you have pre-cooked potatoes in your fridge (and I always do! ), you can make a quick potato salad by combining your cooked spuds with homemade mayonnaise (or Primal Kitchen mayo! ), scallions, salt, and pepper. Sometimes I bake potatoes in the oven, but for salads, I like to boil ’em according to these directions. Although some folks say that white potatoes aren’t Paleo, I eat ‘em because they taste great and they’re a fantastic source of resistant starch after they’ve been cooked and cooled. For an extra punch of umami, I add crispy bacon bits on top. I’ll say it again: meat and potatoes make me happy. But you need more veggies, you say? 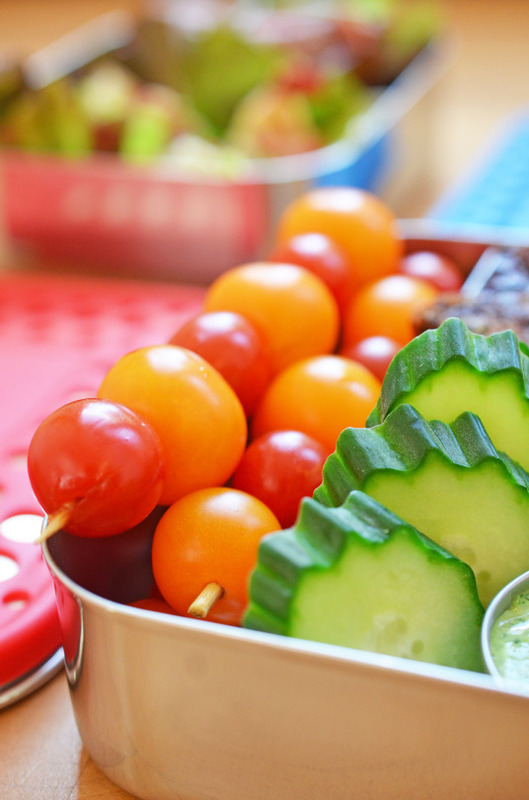 Stab a bunch of cherry tomatoes with a skewer (or don’t, especially if your kids will use them as weapons at school), slice up a couple of cucumbers (the Japanese variety is my favorite), and serve them with a pesto mayonnaise. 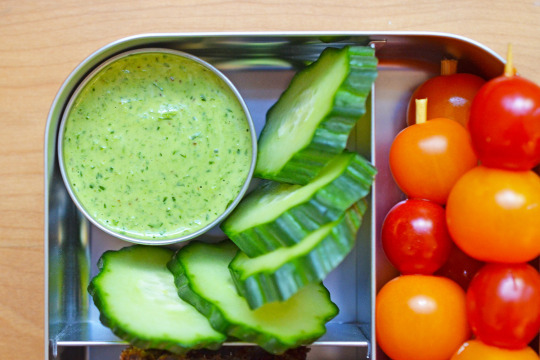 Confession: I also cheated on this zippy green dip. Instead of making my own mayo and combining it 1:1 with a homemade dairy-free pesto, I bought a container of locally made pesto and mixed it with an equal amount of Primal Kitchen Mayo. (Remember: right now, you can save 15% on Primal Kitchen Mayo with the code: nomnom.) You can be a cheater just like me! 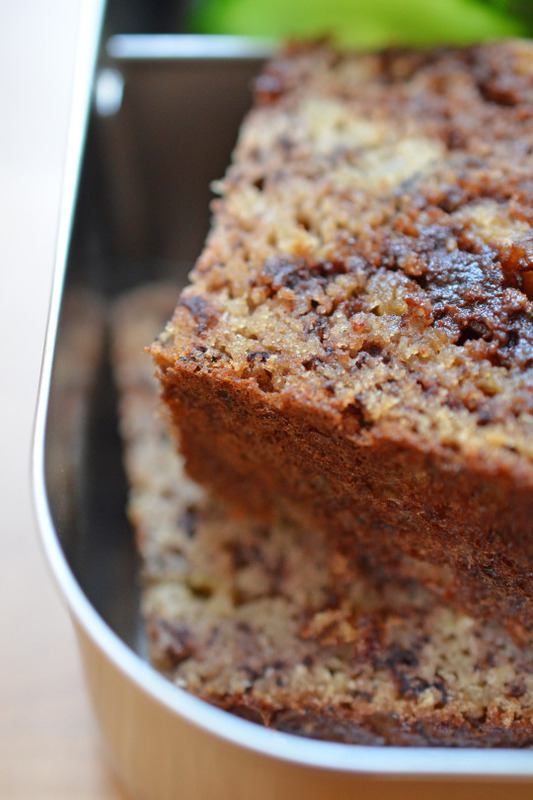 To end lunch on a sweet note, throw in a slice (or two) of Cinnamon Swirl Chocolate Banana Bread from Juli Bauer’s and George Bryant’s The Paleo Kitchen. Unfortunately, if you want this fab grain-free treat, you can’t take shortcuts: you’re going to have to bake it yourself. Luckily, this loaf freezes really well; just bake a loaf on the weekend and freeze individually-wrapped slices for packed lunches. In fact, I just pack the slice straight from the freezer because I know it’ll defrost by lunchtime! Of course, if you are doing a Whole30, you can replace the banana bread with some fruit or more veggies. 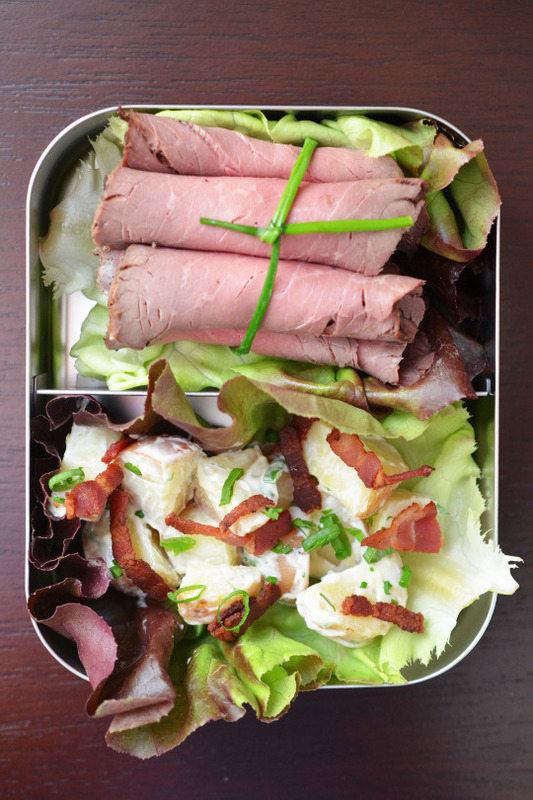 Only one more packed lunch left in this year’s series of packed Paleo lunchboxes! 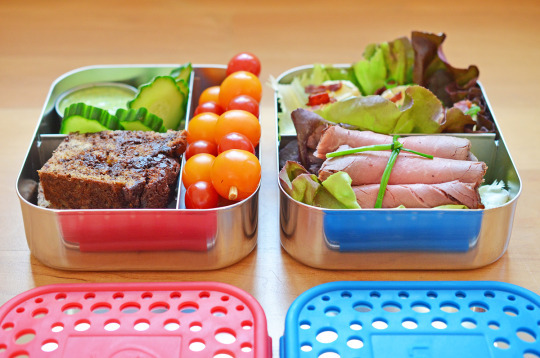 For more ideas, check out this gigantic post of lunch inspiration from years’ past!